Why does my voice crack like that? What should I eat to build muscle? How do I talk to someone I have a crush on? What do I do if someone calls me names or bullies me? Growing from a boy to a man is no easy task. Bodies are changing, social circles are evolving, hair is appearing in places it never was before -- and on top of it all, there's the ever-present pressure to conform to the typical idea of what it means to be "manly" and masculine. But it's easier to do if you're armed with facts. 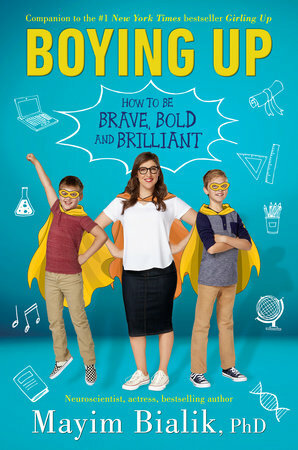 Using personal anecdotes as an overly observant mother of two boys and plenty of scientific information from her life as a neuroscientist, Mayim Bialik, PhD, star of The Big Bang Theory, talks directly to teen boys about what it means to grow from a boy to a man biologically, psychologically, and sociologically. Using the same cool, fun, and friendly tone that she took in Girling Up, Mayim takes boys--and their parents!--through the challenges and triumphs of Boying Up today. In six sections (How Boys Bodies Work; How Boys Grow; How Boys Learn; How Boys Cope; How Boys Love; and How Boys Make a Difference), she takes a look at what it means for boys to come of age in today's world, how can they take control of their paths, and what can they do to help shape the types of futures they want for themselves. When I was given the green light to write Boying Up, I was thrilled and excited—for a few seconds. Then I completely panicked. How would I write this book!? While I am trained as a neuroscientist and spent 12 years of my life in school to get my degrees, my knowledge of the brain, nervous system and endocrine system seemed suddenly insufficient when I thought about the real-life nuts-and-bolts process by which boys become men. As the mother of two sons—one of whom is entering the tween phase—I was reminded again and again as I wrote this book that, despite my degrees, helping my boys navigate this journey isn’t an easy task. Our culture’s expectations of what that journey should look like has long been insufficient to encompass all of the kinds of journeys boys will go on as they Boy Up. Especially now, when our society is recognizing the power inherent in being a boy and urging boys to use that power for good—to speak out for what’s right and help to empower girls and young women—things can feel even more complicated. This Boying Up stuff is hard! Boying Up is a journey I can only observe from where I stand: as a scientist, as a mom and as a part of a culture that often gives conflicting directions about how to Boy Up. The challenges are myriad, and I don’t have all of the answers. What I hope you hav eseen in these pages is the kind of analysis I have chosen to participate in so that I can best support my boys as they enter manhood—and best support you, too, so that you grow into smart, thoughtful, bold, brave and brilliant men. I hope this book is a conversation starter for anyone who is a boy, was a boy or is helping love a boy into manhood. Thank you for coming along on this journey with me.